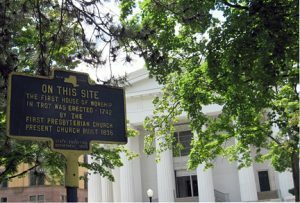 On December 31, 1791, at Ashley’s Inn, the inhabitants of the Town of Troy incorporated themselves into a Presbyterian congregation which was the beginning of the First Presbyterian Church of Troy. Jacob D. Van der Heyden, having given the congregation in Troy three lots on the south side of Congress Street, fronting on First Street, the erection of a plain wooden meeting house, forty by sixty feet, was begun in the summer of 1792. The erection of the new church was begun in the spring of 1835 and on Thursday afternoon, April 23 rd, the cornerstone was laid. The Doric hexastyle architecture of the church made it a very attractive building. The expense of erecting it was about $45,000. 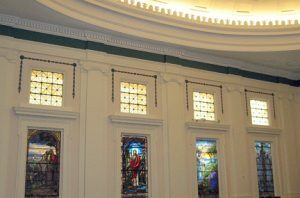 In 1883, three richly colored and figured memorial windows were placed in the front wall of the building. The central one was the gift of a number of the friends of the Rev. N. S. S. Beman, D.D., to whose memory it is inscribed. The one on the west side of it is a memorial to the Rev. Jonas Coe, D.D., the gift of his son-in-law, James Brown of New York City. The east window was given by the congregation in memory of Jacob D. Van der Heyden. The circular window above the west door is in memory of Charles P. Hartt, the gift of his widow. The one above the east door, in memory of Gordon B. Saxton and Philena F. Saxton, was given by their son S. B. Saxton. The church building is an accurate example of a hexastyle Greek Doric temple and is a nationally significant building. Constructed by architect James Harrison Dakin, it is believed to be one of ten surviving examples of his work. 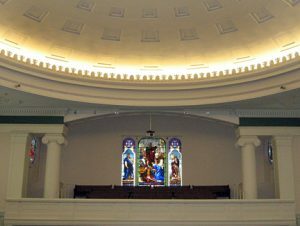 The grand hall has three Tiffany stained glass windows and is enhanced by a dome capped by a skylight cupola. 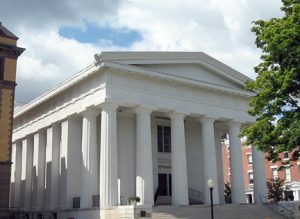 The First Presbyterian Church building was purchased by Russell Sage College in 1974 for campus and community gatherings and events. The building, renamed The Julia Howard Bush Memorial Center in honor of a longtime college trustee, who was also a member of the First Presbyterian Church, had extensive exterior renovation work done in 2004. The following Memorial Names that were found in The Julia Howard Bush Memorial Center were transcribed by TIGS volunteer Rebecca Rector.